Ubuntu includes the convenient Software Center, which provides centralized software management and allows you to search for new software and install it with a mouse click. With an Ubuntu One account, you can purchase software with a credit card. The Debian packages (that end in .deb) that Software Center offers are actually archive files containing libraries, configuration files, and executable programs. If you install the Firefox package, for example, the package manager distributes the necessary files to the correct places in the filesystem. Often there are dependencies, however, which means that installing program A requires that you have program B. The package manager identifies the dependent packages automatically during installation and loads them on the computer. Usually, you will notice the dependencies when you try to install a single Debian package over the Internet. Getting to repositories and installing software often is faster from the command line; the "Quick sources" section goes into greater detail. First, let's look managing packages using Ubuntu's Software Center. To access the Software Center, press the Super key  and entering softw. The start page (Figure 1) features a few What's New and Best Rated applications. Clicking More on the far right gives you additional choices. If you click Turn On Recommendations at the bottom, Ubuntu suggests opening a user account at Ubuntu One. After you do so, your computer regularly sends lists of software you've installed to Canonical and the company returns a list of recommended software that might interest you. These recommendations appear on the start page and can be deactivated with View | Turn Off Recommendations in the global menu. 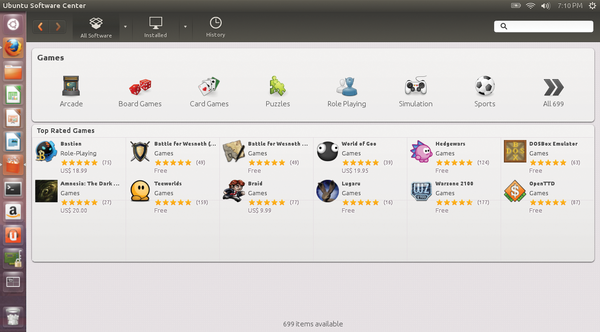 In the meantime, you can purchase programs using your Ubuntu One account. Use the arrow icons in the upper left to return to the start window. With the release of Ubuntu 12.10, Ubuntu developers will place ads for free and commercial software from Software Center across the broad surface of the screen under the heading Our Favorites. 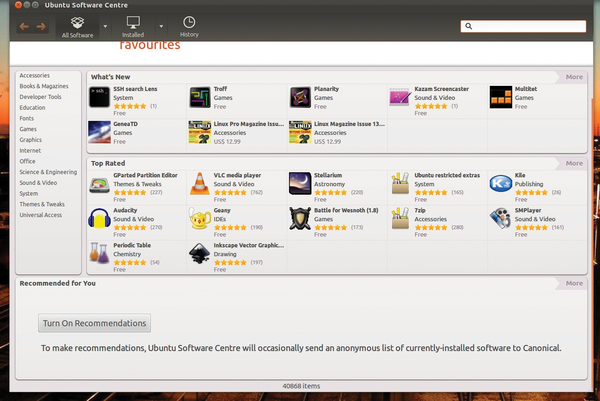 The left side of the Software Center screen organizes the applications by category. Clicking a some categories opens subcategories (Figure 2). All other controls are at the top of the package management window. The All Software menu lists all the software in all the available repositories. Figure 2: Clicking a category on the left opens up other subcategories. 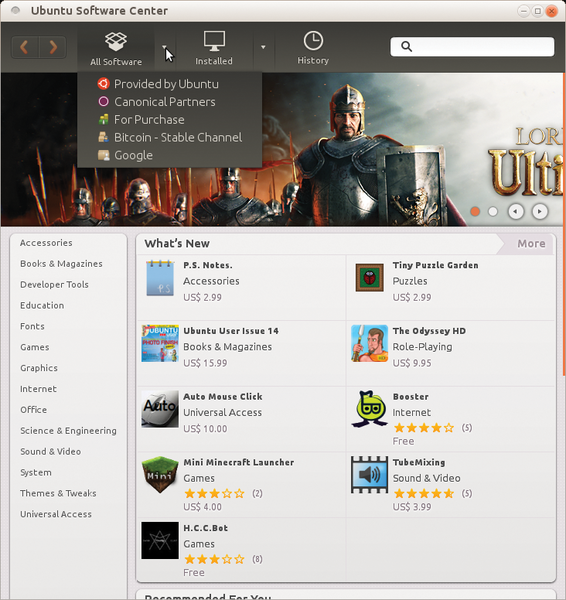 If you click the little white triangle next to the menu item (Figure 3), you'll find the entries Provided by Ubuntu (the most free software), Canonical Partners (free and commercial software without source code, such as Skype and Flash), and For Purchase (commercial software, including many games). In the apps repository listed under Independent, you will find programs of all stripes that aren't necessarily subject to the classic Ubuntu application development rules. Figure 3: Clicking on the little white arrow next to "All Applications" shows you the integrated repositories. Clicking Installed on the menu bar at the top displays only the installed applications, sorted by category. Click the little triangle to the right to view the packages from a single source. At the far right is the History menu item that tells you which software you downloaded. Check here if an upgrade suddenly isn't working. Downgrading, unfortunately, doesn't work in Software Center; you must install the Synaptic Package Manager and specify an earlier Version in the Properties. If you already know the name of the software, search for it in the search field at the upper right. Results come from the repository that you use for All Applications. Next to the software names are the ratings in the form of stars. Once you select a package, the More Info and Install buttons appear. The first button leads to a detailed description of the program, often showing a screenshot (Figure 4). Look under the Add-ons section to see software that could enhance the program. Here, the People also installed section displays other programs to consider. Click the Write your own review link to evaluate the software, which requires a Launchpad account . Sorting reviews by language is a new option. Finally, you can click the Install button to install the program. 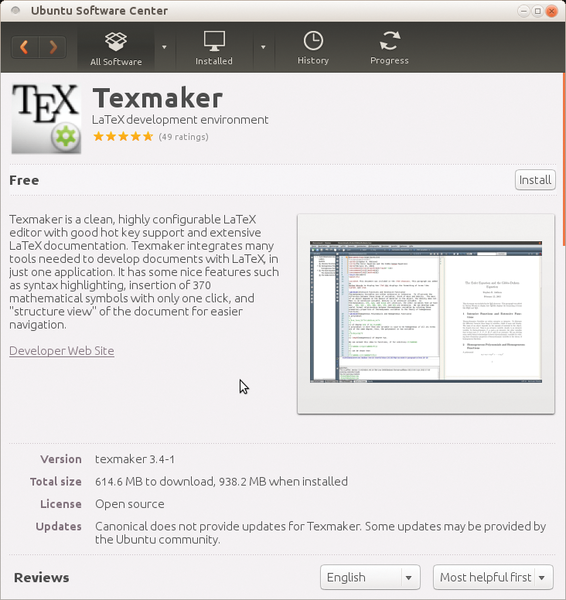 Figure 4: Once you choose an installable package, you'll get further information on it: ratings, screenshots, descriptive text, and more. The search won't find all programs. Software Center hides libraries, developer files, and even programs without graphical interfaces, such as the mplayer command interface. To install these programs, choose Show technical items at the bottom of the window or enter the full name of the software in the search field (Figure 5). Figure 5: Additional libraries, developer files, and programs are listed as technical items. The Software Center global menu includes other interesting options. In the File menu, you can choose Reinstall Previous Purchases or Sync Between Computers to move your package selections to other computers over the Ubuntu One cloud service. Also, you can use Edit | Software Sources to add other repositories. If you don't want to display new applications automatically in the Launcher, unmark the New Applications in Launcher check box. Software Center provides access to thousands of packages, but the one you want might be missing or be available only in an older version. External repositories and PPAs can help. The Medibuntu repository  is one of the external repositories and provides multimedia programs that are missing from Ubuntu's standard repositories. The VirtualBox project  also provides the proprietary version of its own software, which supports the virtual USB 2.0 ports and Remote Desktop Protocol (RDP), from its own repository. Personal Package Archives (PPAs) are special versions of external repositories that you can only find on Ubuntu's Launchpad. When experienced Ubuntu users or developers create Debian packages from their favorite software, they frequently offer them in their personal package archive on Launchpad. Using a search function , you can peruse the platform for new versions of current software with great success.